Click on the link to see behind the scenes, raucous kitchen outtakes of our experience preparing Bobe’s Passover Gefilte Fish. Follow our written recipe for full instructions. Writing recipes is not something that you just know how to do. As we’ve tried to document both our recipes and those of other home cooks, it’s been a learning curve to figure the whole thing out. Last spring, we had a professional recipe consultant, Margaret Ferrazzi, come to our home to give us a little guidance in our recipe writing undertaking. While most of our videos show recipes in a neat little succession, what happens behind the scenes (measuring, discussing, timing, writing everything down) is quite different. 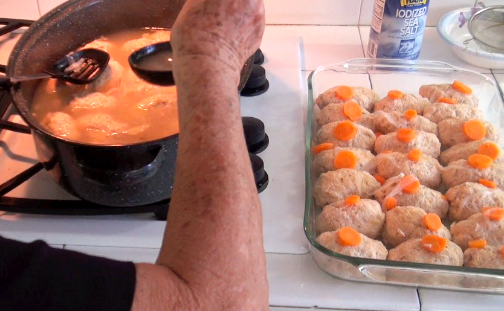 The video above is a fun, blooper-type look, filmed by Alex, of my Mother-in-Law Dora cooking gefilte fish from scratch before Passover, me writing down her recipe, and Margaret guiding us through it all. We had a lot of fun in the kitchen and the finished product was amazing. Place all of the broth ingredients in an eight to ten quart saucepan, and bring to a boil, lower heat, cover and simmer for 10-15 minutes. Remove from heat and then remove the bones from the broth, keeping the broth hot on low heat, while you make the fish mixture. Place all of the ground fish, carrot and onion in a large bowl and mix. Add matzoh meal, eggs, salt and pepper and with hands mix gently but thoroughly, until fish is light in texture and holds its shape. Using damp hands take about 1/3-1/2 cup quantities of the fish mixture, shape into oval patties, and gently drop into the fish broth, which is hot but not boiling. When you have dropped the last fish patty into the broth, raise the heat and simmer for 1 -1/2 hours. After the Gefilte Fish has simmered for 1-1/2 hours in the fish broth, remove from heat and allow to cool. When room temperature, transfer the fish loaves to a serving dish, and Retain the carrots from the fish broth for garnish. Arrange the fish patties on a serving platter, and garnish with the cooked carrots and fresh parsley. Serve as an appetizer accompanied by red or white horseradish. Recipe may be prepared a day in advance and refrigerated. Recipe serves 24 and may easily be cut in half. This Passover our family is fortunate to have my dear mother-in-law, Dora Schmidt, visiting from Mexico City. In Mexico Bubbies are called Bobe, (pronounced – baubeh), and that is what my kids have always lovingly called her. Many years ago, Dora taught me to make this wonderful Passover apple cake. It is easy to make and the truth is that it is great for dessert any time of year. When my friend Irene invited us over for Shabbat dinner last Friday, she requested that we bring this cake. It was a big hit! Pre-heat oven to 400 degrees. Thinly slice the apples in a food processor, and place them in a large bowl. Add the lemon juice and the sugar, mix well, and set aside. In a separate bowl mix all of the batter ingredients with a hand mixer. 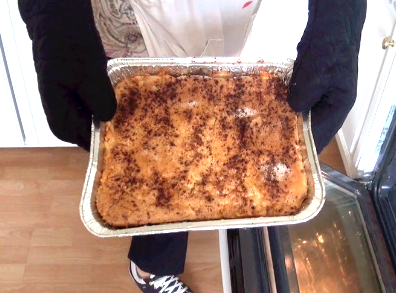 When thoroughly mixed, spread a little more than one-third of the batter over the bottom (it will be a very thin layer) of a deep baking dish (We used an aluminum foil pan as shown in the photo). Gently add all of the sliced apple mix over the batter, and evenly spread the remaining two-thirds of batter over the apple filling. Sprinkle with sugar and cinnamon and bake for 1 hour. There was nothing worse than having to go to posture classes with Madame Ilonka. Her studio was in a building next to where my mother had her hair done. 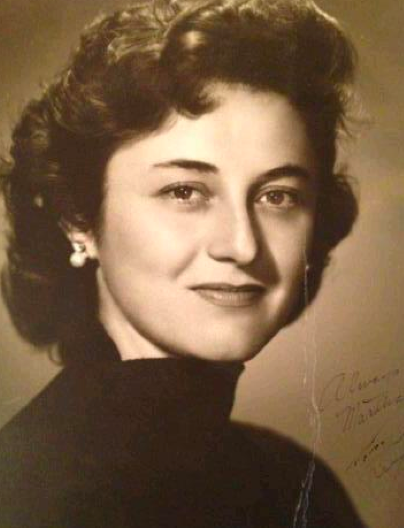 My mother had beautiful hair and she took very good care of it. While my mother’s hair was being washed, then rinsed with beer, rinsed again, conditioned, and then styled, I would have to go see Madame Ilonka. You see, my mother had scoliosis as did both her parents, and although she knew that scoliosis was an inherited trait, she hoped that by sending me to posture class it would increase the chances of preventing scoliosis in me. my mother would come knocking at the door as I was on the verge of running out of there before class was over. My mother with her fresh hairdo would pay Madame Ilonka, and would mix Hungarian with Spanish and say “visontlatash, hasta la proxima.” Goodbye, until next time…and I would be thinking oy vey, HELP! “Susie” my mom said to me, “Vamos a taquear. 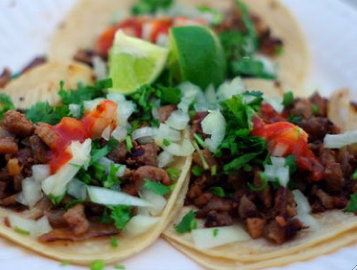 Let’s go get some great tacos, who knows when we’ll be able to get a good taco next?” I was always my mom’s willing companion, so we happily went off to eat the best meal in the world — the fresh tacos at the stands by the university (we didn’t keep kosher in those days). We happily smothered our tacos in spicy sauces and topped them off with mountains of cilantro and onions. That was on the eve of December 4, 1964, the day my mother and I caught the last flight of the day from Mexico City to Los Angeles. The only places I had ever been outside of Mexico City were Acapulco and Cuernavaca. I didn’t want to leave Mexico, but I was only eleven and a half and I had no say in where I was to live. I carried with me my most precious possessions. In one hand I had the real looking baby doll on whom I had once performed surgery to see exactly how she made that crying sound. After the surgery, she never cried again and still bore the old scar. In my other hand I held my favorite stuffed animal — a small, light brown squirrel. My squirrel held a bouquet of flowers in its paw. The flowers were really miniature colorful light bulbs that lit up when you squeezed the squirrel’s tail. Every night after my mother tucked me in and turned off the light, I would pull the covers up over my head and light up my little squirrel. It was cozy and safe under there. On the plane, I felt so lucky to be sitting by the window. Once we were high in the air, I asked my mother if I could open the window; I really thought you could. The excitement of being on an airplane and the prospect that our family would soon be together again made me forget, for a while, that I was leaving my home forever. The place where I was born would now be far away from me. The L. A. Airport was so big and clean. Even the air had a different scent. The buzzing sound of English all around me was new and strange. I did speak some English because my father was born in New York, and had spoken it to us as we were growing up, but I wasn’t used to it being spoken all around me. “There they are,” I screamed as I spotted my father and two brothers. We all hugged each other, we cried and cried, then we laughed and cried again. As we walked to the exit we all clung to each other, never again wanting to let go. We had been separated so long. Six months before, after loading his and my brothers’ suitcases into the car, my father filled the rest of the small black Renault Dauphine with the ladies’ leather handbags he had left over after closing his factory. I cried as I stood there with my mother, watching my father slowly back out, and sadly wave goodbye. He drove away and headed north for the border, and a new life in Los Angeles. Back at the airport, we all said we were starving. My father said he knew of a great delicatessen. I had never heard the word before. He took us straight to Canter’s on Fairfax Avenue. 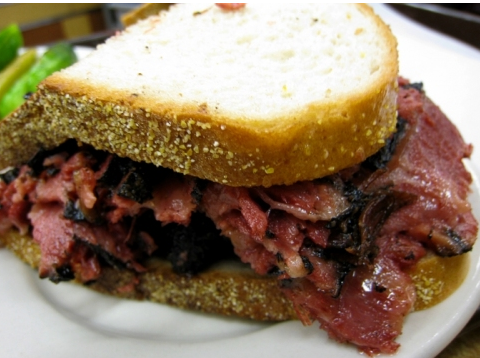 I saw things on the menu that were considered gourmet because there were very few, if any places in Mexico that served lox, bagels and cream cheese, chopped liver, gefilte fish or herring, or pastrami or corned beef sandwiches. My family loved these foods just as much as we loved a great taco, albeit in a completely different and unique category. I was amazed when our server spoke to us in English. As she walked away after taking our order, I turned to my mother and said, “Hasta las meseras hablan ingles?” Even the waitresses speak English? My parents lovingly chuckled at my innocence. This was my Mexican-Jewish cultural crash landing when I first arrived in L.A. 47 years ago. I was in for a long adjustment period…about 3 years.